NOTE: A small flyer with the information below are supplied with each miniture Tzedakah Box. 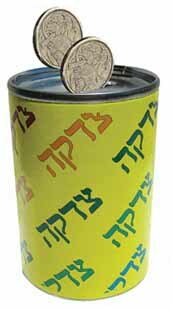 When I was growing up as a child in Melbourne, I would see my father place coins into our 'Blue Box' every Friday afternoon before Shabbat. Once or twice a year a man would come to our home, empty the box, and take the coins away. It was not until I was older that I understood what was going on. My wife and I now continue this Friday afternoon Tzedakah ritual in our own home. When my father passed away in June 2006, I wanted to somehow continue his legacy of Chesed (kindness) and Tzedakah (charity), and go one step further and try to teach even the youngest child the concepts behind these two words. As a child, I never really understood the notion of Tzedakah. I thought that if a young child saw the results of his labour, so to speak, he would appreciate his actions so much more. To me, the long-term benefits to the child are obvious. It is our duty as Jews to extend ourselves to help others, and what could be greater than parents and their children coming together to fulfil their obligations to their community. So, to put this into practice, my wife and I have devised a simple Tzedakah program for young children (and their parents), which will hopefully benefit them in their future lives as caring individuals. to anyone who wants them - one per child. Your child's name should be written on the box in the space provided. The box then remains the property of your child. One or more coins should be provided to your child, ideally each Friday afternoon before Shabbat, or any other regular time during the week. Your child should be encouraged to place the coins in the box by him or herself. If your child is old enough to receive pocket money, then he or she can be encouraged to place some of it into the box. However, putting coins in a Tzedakah box is just not enough for young children to understand the concept of kindness and charity. Once the box is almost full, explain to your child that you will be taking him or her, and the box, to a special place where the coins will be emptied out and used to help someone in need. If possible, try to vary the places where you go each time the box gets full. Most importantly, get your child involved with the decision-making process, and try to follow their interests. It could be as simple as taking the box (and your child) to a store, buying a gift with the coins, and then taking your child to a kindergarten or children's hospital, and letting him or her physically donate the gift. The project needs to be 'hands-on', where the child can experience first-hand the positive results of filling up the Tzedakah box. Hopefully it will make him or her feel good. As these boxes are quite small, they should fill up in a relatively short time. This is why we chose a small box rather than a big one. There is no ‘rocket science’ involved with this project. We believe that with care and guidance, the benefits of these small acts of kindness will manifest themselves into positive traits as children grow into adulthood. If you damage or lose a box, or would like one sent to another child, just give us a call in Australia on 0418 266 487, or visit our website. Please spread the word about this project so that it can benefit as many children as possible all around the world. We will deliver the Tzedakah box and this program free anywhere in Australia. Overseas inquiries welcome. of Imre Gescheit who was a gentle, kind and charitable man. Copyright © Kidz 4 Tzedakah 2018. All rights reserved.